You’ve seen the non-glowing fidget spinners, now you can experience the LED fidget spinner truly the hottest new toy to hit the market. 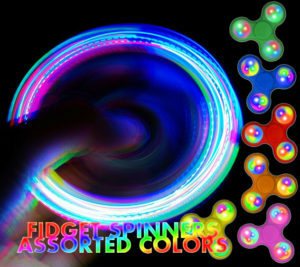 Each spinner features 9 multi colored lights that create psychedelic lighting effects that are truly are memorizing. With a flick of your finger you can achieve up to 2 minutes of quiet spin time utilizing the ceramic ball bearings. Measuring approximately 3 inches in diameter, each fidget spinner can easily fit inside your pocket and travel easily anywhere you go. In addition to the awesome LED lights these finger toys can help attention-deficit sufferers from anxiety and environmental distractions. It’s known that a large percentage of our youth suffer from attention-deficit disorders that distract them from learning. Fidgeting is known as uncontrollable nervousness, boredom, or agitation. Fidget toys are recommended as a sensory toy to help reduce the uncontrollable activities of fidgeting. In addition to controlling fidgeting activities sensory toys can also reduce stress and actively promote concentration. Watch the LED Fidget Spinner in Action! Each fidget spinner uses tiny skateboard type ball bearings that are super quiet allowing their use in environments like libraries where loud noises are not allowed. Get started spinning today, and order some awesome flashing hand spinners!